Have you heard of Doorposts? We have a few of their resources which I really like. They have just begun their new blog and to celebrate are giving away a resource for 10 days. Then, someone will win all of their resources. Yes ALL of them. That is amazing. 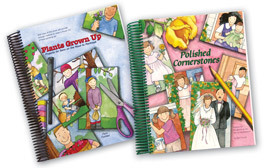 Today's giveaway is either Plants Grown Up or Polished Cornerstones (winner's choice). Go here to enter! what!!!!! that is wonderful, what a Blessing, thanks for sharing!!!! I know! Can you believe it? !